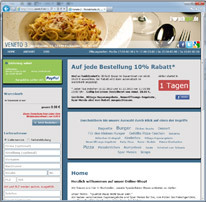 The customizable content-management-system lunchspot cms 1.0 for restaurants and diners is one of the best on the market. Featured with a predefined template, online ordering, fax integration and dynamic integration of special offers, lunchspot cms 1.0 delivers an easy-to-use product with a great variety of options. We have continually worked on our product, version 2.0 of the lunchspot cms has been released by now. Interested? Write us an email at: info@lunchspot.de for more information.